Mollie is a leading European payment gateway processing payments for 55.000+ merchants across Europe. The integration of Mollie with your Spree Commerce store can be done quickly and easily following the guidelines mentioned below. Create a local experience for your international customers. Your customers have the freedom to pay with their preferred currency. Access all major payment methods with a single contract. Feel secure with smart fraud monitoring on all your payments. Give your customers low effort payments resulting in higher conversions. Everyone is different, create a payment plan that fits your business. Safer payments with dynamic 3D secure on credit card payments. You’ll sleep better knowing your payment data is in good hands. Wherever you go, payment screens are optimized with automatic device detection. With Mollie you only pay, a transparent and low fee, for every successful transaction. Good news! 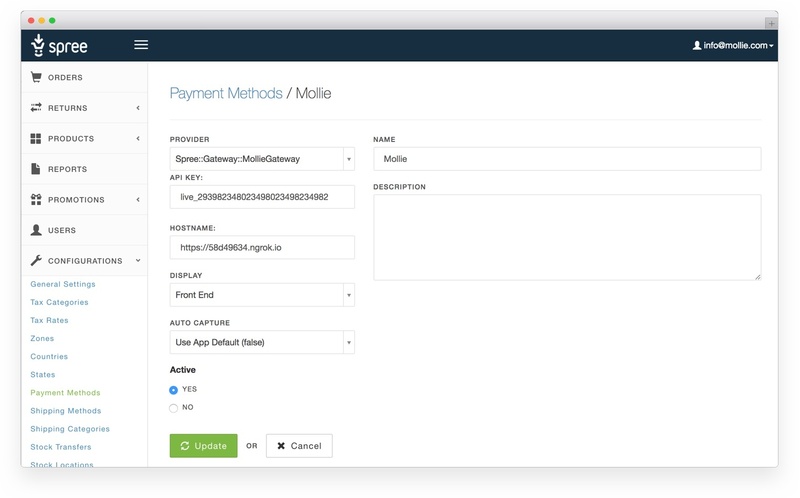 Now you can use the official Mollie payment gateway for Spree Commerce. This gateway supports all aspect of Spree Commerce and payments can be created through both spree_frontend and spree_api. Please go to the signup page to create a new Mollie account and start receiving payments in a couple of minutes. Configure a new payment method (Spree Admin -> Configurations -> Payment Methods -> New Payment Method). Select Spree::Gateway::MollieGateway as a Provider. Fill in your live / test API key. Fill in your hostname. Used for generating the webhook URL and redirect URL. Select “Front End” in the Display selectbox.